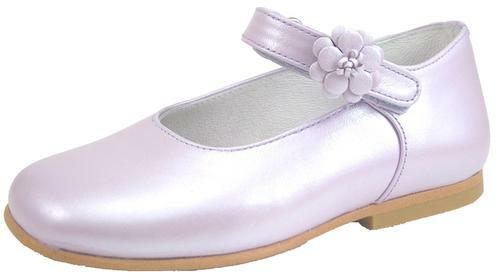 Dress Mary Janes in a beautiful shade of premium lilac/lavender pearlized leather with handmade flowers, perfect for special occasions. Handcrafted in Spain using top quality components. Full leather breathable lining and insole with cushioned arch support. Internal "counters" for support and good wear. 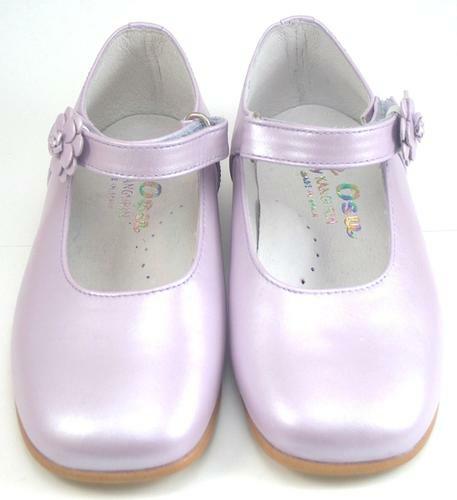 Leather-substitute sole with Euro non-slip inserts. Sale. MSRP $110.00. Euro 17/US 2 = 4 1/4"
Euro 27/US 10 = 6 3/4"
Euro 30/US 12 = 7 1/2"